She’s crafty: Ashes outfits | Beckie and Jeremy Take on the World! My enjoyment of crafts and Jeremy’s love of Being Serious have resulted in some elaborate costumes for Halloween and various Northwestern sporting events. 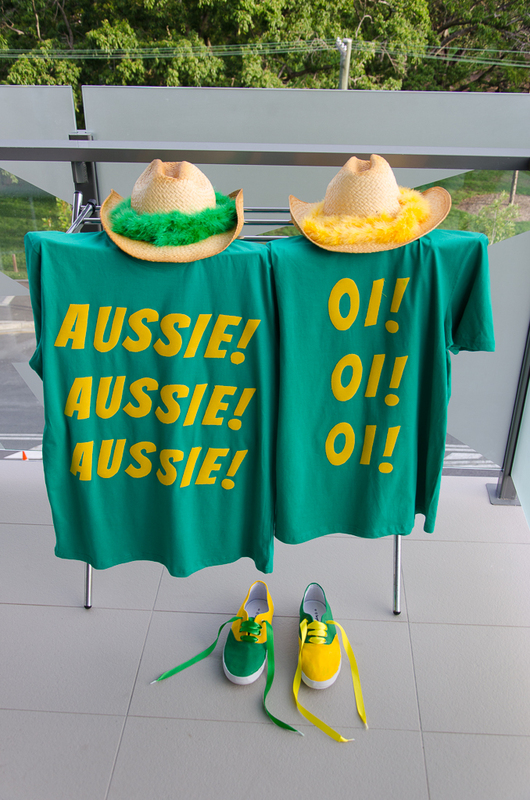 We are going to day 4 of the first Ashes test tomorrow, so we obviously needed some Australian superfan outfits. I didn’t start working on them on Thursday as I’d planned because Australia played so dismally that we thought they might have lost before Sunday. Fortunately, England’s massive collapse yesterday means that we’re in a good position to see Australia win tomorrow, so today was craft day. Actually, being Northwestern superfans hasn’t required much in the way of crafts, since there are two shops within walking distance that are dedicated to purple gear. It was surprisingly hard to find good green and gold stuff here, so I made some iron-on transfers for plain green t-shirts and painted some cheap sneakers (the second pair are in progress. Stay tuned for the full outfits and match report. This entry was posted in She's crafty by Beckie. Bookmark the permalink.